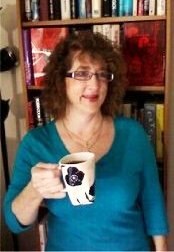 For the fifth in this regular series of quickfire author interviews, I put the 9mm questions to Margot Kinberg, who has published two mystery novels starring police detective-turned professor Joel Williams, while herself working as an Associate Professor at National University in San Diego (specialising in linguistics in the School of Education). A crime fiction afficiando, Kinberg is also the creator of the excellent crime and mystery fiction blog, Confessions of a Mystery Novelist. I have just received copies of both of Kinberg's novels, PUBLISH OR PERISH and B-VERY FLAT, and am very much looking forward to reading them. I've heard good things from people whose opinions I respect, and I will publish my own reviews in due course. Kinberg is currently working on her third Joel Williams novel. Who is your favourite recurring crime fiction hero/detective? That's a difficult question, as I've become a fan of several sleuths, each of whom has brought something special to the genre. I would say, though, that my favorite is Agatha Christie's Hercule Poirot. Poirot is deliciously flawed, although he's brilliant, of course, and Christie gave his character multiple layers over the years. I think my real reason for choosing Poirot, though, is a sentimental one. Although I was first introduced to crime fiction through Conan Doyle's Sherlock Holmes, I really became a fan of the genre through Agatha Christie and Hercule Poirot. What was the very first book you remember reading and really loving, and why? If you mean the first crime fiction book I remember reading and loving, it was Agatha Christie's Mrs. McGinty's Dead, which I first read when I got it as a gift when I was a young teenager. I was immediately drawn to the characters and to the intellectual puzzle. That book's got a fascinating connection between past events and the murder under investigation, too, and I found that irresistible as well. Ever since I read that book, I've been a crime fiction fan. I still have my original copy of it. I come from an academic background, so I'd written a few non-fiction, scholarly books and articles. I also wrote a few unpublished short stories years ago. Most of my non-fiction has to do with second language learning and teaching and literacy development. I've especially focused on language immersion programs, where children learn a new language (or maintain their own heritage language) through being taught in that language. In fact, the Maori language schools in New Zealand have always fascinated me. I love music - listening to it, singing and playing (keyboard and piano). I've got pretty eclectic taste in music, too, although I listen to a wider variety of music than I play and sing. I'm a serious fan of Billy Joel (So Billy Joel, if you're reading this....). While I'm never going to get a recording contract, I've very much enjoyed playing and singing in coffeehouses and just for fun (although I haven't done that in a while). In fact, at one school where I taught for a few years, I was one of the DJs's for the college radio station. I also enjoy horses and riding, although I don't get the time for that that I wish I did. When I was very young, I thought of becoming a jockey; it never happened, but I do like to ride. In the part of Pennsylvania where I grew up, there's a large Amish community. There are "touristy" places with so-called "Amish" themes, but I would recommend avoiding them. Instead, I would recommend that visitors try the wonderful farmers' markets and small shops in south-central Pennsylvania. That, and a long drive through the area on an autumn afternoon wuld show visitors how beautiful that part of the country is. In Philadelphia, where I spent most of my adult life before moving to California, visitors should sample South Philadelphia's Italian Market, and the interesting little bars, restaurants and fun (and sometimes bizarre) shops on South Street. Also, I recommend a walk through Philadelphia's Old City; there's a real sense of U.S. colonial history there, and in fact, many of Philadelphia's original old buildings are still intact. For Americans, it gives one a sense of one's own history. For those visiting the States, it's a window on the the country's history. I think authors get connected, in way, to all of their books, even the ones that don't turn out as well. They are creations that come from within the author, so I think there's always that intimate tie. But I feel a special fondness for Publish or Perish. It's got plenty of flaws, but it was my first crime fiction novel, so I've got a special connection with it. It opened the door for me to the world of fiction writing (I know, that may sound cliche, but it's quite true). Oh, I will never forget that feeling. I was, of course, absolutely thrilled, but also had a sense that it wasn't quite real. Yet, there my name was, on the contract. When I signed the contract, my family and I celebrated with a bottle of special champagne we'd been saving. Then, when I got my authors' copies of Publish or Perish, it was exciting all over again, I must admit. Thank you Margot Kinberg. We appreciate you taking the time to talk with Crime Watch. So what do you think of Margot Kinberg's answers? Have you read any of her Joel Williams mysteries? If so, what did you think? Do they sound appealing? Feedback, thoughts, and comments greatly appreciated. I adore this interview with Margot ~ you asked great questions, and I enjoyed reading Margot's answers. I'm a fan of Margot's and her blog, she is an amazing talent. What a wealth of information she is. Her blog posts are so chock full of information. Congrats to Margot on her two novels, and best wishes as she works on the 3rd. I look forward to reading those novels. Thanks again, Craig. As a fellow professor, I gotta love her subject. Adding Publish Or Perish to my reading list -- thanks for bringing Margot to my attention! That was great. I'll have to track down Margot's books. I'll definitely remember the warning about coffee shops! Very happy to find your blog, Craig! I've followed Margot Kinberg's blog, "Confessions of a Mystery Novelist" for some time now and there's no-one to match her knowledge of the elements of crime fiction. I have family in New Zealand and I would tell them and any of your readers that Margot Kinberg is a name to watch for. Thanks for a great blog. Thanks so much for the great interview, Craig! I discovered Margot's blog recently, and am now a huge fan - she is so good at finding themes and making connections. I enjoyed learning more about her - good questions! I have not read any of her books yet, but really look forward to reading them all. I like Margot's blog a lot, stop by every day and read it, think and read but can't comment as I don't have a blog. However, I'll say it here that I like it, smile, learn something of new authors, enjoy her posts, and appreciate her fundraising for the New Zealand survivors. I will keep on stopping by and enjoying her writings and those comments.